Children who depend on life-saving blood transfusions are encouraging donors to give blood during the Easter holidays to ensure NHS Blood and Transplant has the blood stocks necessary to meet demand. 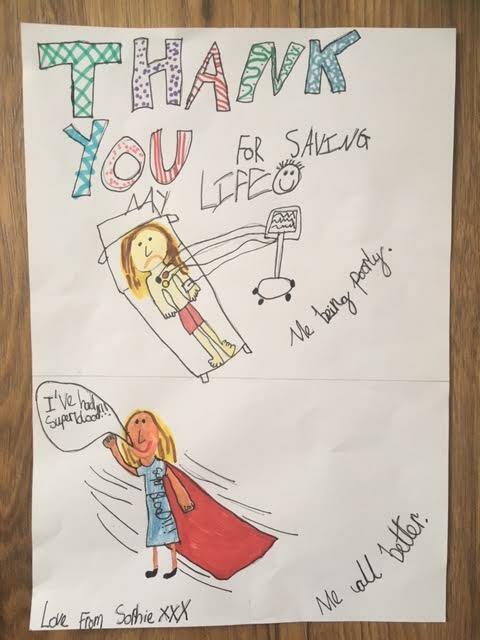 Eight-year old Sophie Thorne is one of several youngsters contributing a 'thank you' picture to remind people in Luton and Bedfordshire that donating blood saves lives. Blood stocks are more vulnerable to shortfall around public holidays like Easter as the weather improves, and people go on holiday or enjoy days out with family. It is vital stocks are constantly replenished as blood has a shelf life of 35 days and platelets only seven days. Hospitals across England need more than 6,000 blood donations every day to treat patients. Blood or the components of blood are used to treat patients with medical conditions such as anaemia, cancer blood disorders, and those having surgery. Catherine Thorne, Sophie's mother, of Wootton near Bedford, said: "Sophie has a rare blood condition called Hereditary Spherocytosis. When she was three she caught a virus, became severely anaemic and needed an urgent blood transfusion at Bedford Hospital. It was a real emergency and we wondered if we would get her through the next 24 hours. She called her transfusion her 'super power blood', and it was really was! I still can't believe the difference it made in 12 hours. She could need another transfusion at any time if the haemoglobin, or oxygen carriers, in her blood cells falls below a certain level. I started donating a few months later in 2012 as I saw how much of a difference giving blood can make to people's lives." Michelle Laserna, Senior Marketing Coordinator at NHS Blood and Transplant, said: "Why not swap a chocolate egg for a cup of tea and a chocolate biscuit at your local blood donation centre? Every blood donation can help save or improve up to three lives and we would like to thank all our blood donors for their dedication. The need for blood never stops and I urge donors to book an appointment in the Easter holidays if it's time for them to donate again." Every blood donation is vital, but NHS Blood and Transplant particularly needs to ensure supplies of the universal blood group O negative, which is often in short supply as demand is so great. There is also a need for supplies of rarer blood types including A negative and B negative. It's also important for more people from black and Asian backgrounds to donate blood. Some disorders, such as Sickle Cell Disease and Thalassaemia are more common in patients from these backgrounds and they have a need for well matched blood. Donors from the same ethnic background are more likely to be a close match. Donating a unit of blood takes less than an hour from appointment time. To book an appointment visit www.blood.co.uk or call 0300 123 23 23 to find your nearest session. Platelets can be donated at 23 dedicated centres across the country. The Luton Donor Centre is located in St Georges Square, Bridge Street, Luton.